The day we’ve been waiting for finally arrived. The civil wedding at 15h followed by drinks and canapés at from 14h to 16h then dinner from 20h that ran into dancing from 23h and ended for us at pumpkin o’clock when Sophie fell asleep on Chris’ knees and we went home in a taxi. We went out in the morning and on our way home met a taxi driver who offered to take us to the wedding. 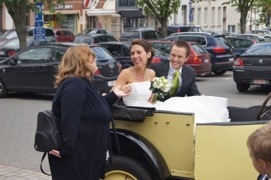 So he dropped us home at 1.30 and we asked him to come back at 2pm which he did and we headed, all dressed up, to the Maison Communale (Community Hall) La Hulpe for the ceremony. We were among the first to be there and struck up a conversation with two young fellows, Vincent, the best man, and Kevin, a friend of Julie’s who’d hired a car and just driven for 2 hours from Paris. They had just met and both spoke English well. So after we all established how we knew Julie or Laurent and chatted for a while. 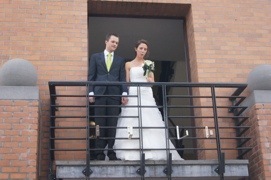 I boldly asked them if they could give us a lift to the reception which they both said they could. 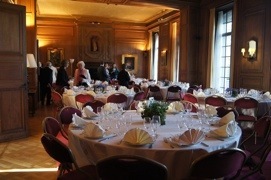 We went inside and upstairs to the room where the ceremony would take place. We sat down and waited for a short while then Di got up to look out the window and see if Julie and Laurent were coming. They arrived in a 1926 Citroen that was open air and very cute. Helene was down there too so Di and the kids went down to say hi to her and to wave to Julie and Laurent as they posed for photos getting out of the little car. It was standing room only in the hall with the few rows of chairs underestimating the number of guests in attendance. It seems that civil ceremonies are not usually so well attended. The ceremony was conducted (in French) by the Mayor of La Hulpe and a female assistant. It was over in about 30 minutes and the Mayor presented Laurent and Julie with a gift which they unwrapped in front of everyone. It was a painting given to them by the church in La Hulpe. This is not usual but it turns out that Laurent’s grandparents are well respected in La Hulpe for their services to the community. Julie and Laurent stood while their families congratulated them followed by everyone in the room then everyone moved downstairs to wait outside. We were the last ones to go out and minutes later Julie and Laurent appeared on the balcony and everyone cheered as J &L waved and kissed each other. 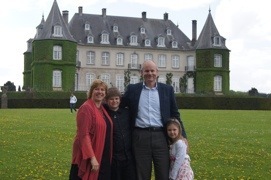 Then Kevin found us and, with navigation by Chris, kindly drove us to Chateau de La Hulpe for the celebrations. Driving along the long driveway we caught sight of the castle. It was the stuff of fairytales. Once again Julie and Laurent greeted everybody at the door. 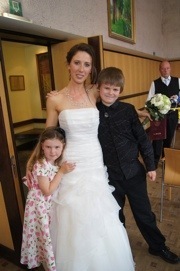 There were many who hadn’t been at the ceremony, luckily because they wouldn’t have fitted. There were 300 guests at the drinks celebration. Laurent’s parents are both doctors and the family is well known. Despite the number of people, it was a pretty relaxed afternoon. Julie pointed out a couple, Phillip and Kim, who spoke English well and we chatted to them while we looked out for waiters with food trays. While Sophie didn’t remember Helene, from the 6 months she spent with us when Sophie was two, she quickly realised that she liked Helene and Sophie was either with, or looking for, “the girl who looks like an angel” (Helene). Sophie also spent time frolicking around in and outside the castle. Matthew was quite committed to finding waiters who had food on their trays that he liked and stalked the lady with the spring rolls and samosas. Around 6pm numbers started to dwindle. We were left with 130 for the sit down dinner. A notice with the table compositions showed us that Matthew and Sophie were seated with Helene and Gauthier and Chris and I were at a different table. It was perfect! 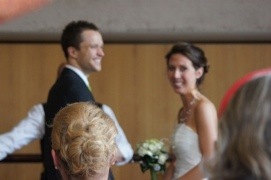 We’ve really had enough of each other’s company and Helene and Gauthier looked after Matthew and Sophie really well. They had a ball! Chris and I were among 4 other couples, all of whom spoke quite good English. They were all friends of Laurent’s parents’ but didn’t know each other. We all engaged in interesting conversations. The service for dinner was buffet style and the food was excellent. The desserts were fabulous too and everyone was allowed to get seconds of both courses which, it goes without saying, The Stevenson’s did. After Julie’s Aunty made a speech that we couldn’t understand because it was in French, the dancing started. Firstly with Julie and her Dad and Laurent and his Mum then various combinations of family members with Laurent and his Grandma receiving the loudest applause. Matthew asked Sophie to dance with him but she declined so he asked me. I was flattered and we danced onto the dance floor and bobbed around together. Matthew said we were like the Muppets. It became time to call our taxi friend and my phone had run out of charge. Gauthier borrowed a phone from his friend and called the taxi for us. It would arrive in half an hour. It was sad to leave the party. It had been a magical experience but we were all glad to hit the bed and took no time at all to fall asleep. So, back to the morning… We wanted to have a waffle at the Grand Place but first Chris went to the Eurail office to secure our seats for the next legs of our journey. He came back having had a successful mission. Our seats were booked for Brussels to Lyon for Sunday at 12.18 then our seats for Lyon to Aix en Provence on Tuesday. Well done Chris! We booked a hotel in Lyon for two nights based on a recommendation from our dentist who’s wife is French. We are staying at Hôtel des Célestins. We then thought we should book our seats from Aix en Provence back to Paris so we can catch the plane home on Monday. So we all trudged off to the Eurail office with the intention of then going to have a waffle at the Grand Place. uh oh. There are no seats left on the train that would have allowed us to leave in the morning of the 21st to get to the airport in Paris in time for our flight. Not even any left on the day before. It is a long weekend in Belgium so many people are going to Paris. At the moment our only options are to hire a car and drive the 8 hours to Paris and spend a night in a hotel there so we can get to the airport for our 12 o’clock flight or fly from Marseilles to Paris. I will check the cost of flights to Paris versus the cost of pushing our return flights back a day. Will keep you posted. This process took so long we were cutting it fine to have our waffles. We started walking as quickly as we could manage, Chris pigging backing Sophie, in the direction of the Grand Place. It was further than we thought and it became a case of getting a taxi home to get ready for the wedding or be late for the wedding. Well what a lucky taxi Chris found. The driver was Cambodian. He spoke English well enough to have a conversation with him. We told him we were going to a wedding and he offered to take us. He told us his son will take over driving the taxi after him and gave us his and his son’s number on a piece of paper. If we wanted his son to pick us up at the end of the wedding we should just call his son. He also offered that if we wanted him, the father, to take us to the station in the morning we should call him. It took a lot of the stress out of organising transport to have a driver we could call who knew who we were and who spoke English. I’ve just spent ages reading through the last 12 days of your trip. What a wonderful adventure! I can’t wait to hear all about it in person when you get home.